Fifty million Biafrans across the nation are gearing up for a referendum, one big decisive event that will determine their fate and as well set Nigeria on an everlasting shattering mode. 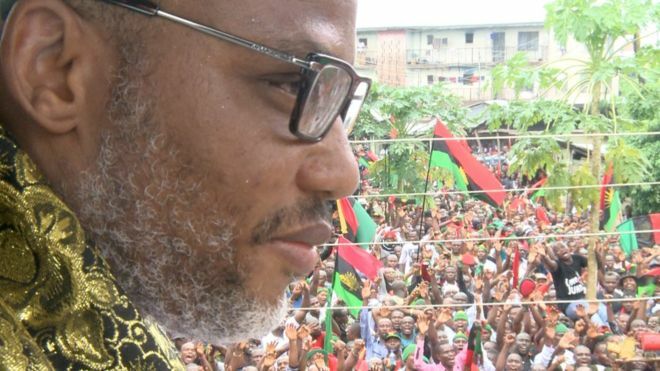 Many have favored a referendum vote for an independent state of Biafra whilst many are calling rather for a restructuring of the current system of government but have received huge criticism by the pro-Biafran supporters calling it a waste of time because it had been proposed before in 1967 and 2014 national confab respectively but has been hugely ignored by the political leaders mostly from the North. The Southeast has been largely marginalized by the federal government, therefore, raising all for separation and unending uprising following a brutal clampdown on pro-Biafra supporters which has left many dead, allegedly thousands as reported by Amnesty International. One of the leading movements in the Biafra struggle "IPOB" is at the forefront with the whereabouts of its charismatic leader, Nnamdi Kanu, unknown after the military invasion of his home residence last September, which sparked outrage among members and sympathizers. Mr. Kanu who was arrested in October 2015 in a Lagos Hotel was charged to court on a treasonable felony. He was issued bail in June 2017 with a stringent condition of not to speak or appear in public. Kanu reportedly broke his silence after accusing the Nigerian media of falsely publishing lies against him, therefore had to come out to speak for himself rather than remain silent. He took to the media to make it clear that the people of the Old Eastern region of the country will no longer participate in any further political activity in the country, leading the group to launch the famous "No election" campaign which was first tried in Anambra state last November and recorded huge success as few citizens turned out to vote in the governorship election. The campaign has so far upset the Nigerian government as the group is currently campaigning for a total boycott of the 2019 general elections unless a referendum is awarded to them. But despite massive support for the campaign, the group still faces big opposition from within the region with different factions and in-house division. Last week, the group backed out of a negotiating deal with the socio-cultural Igbo apex group "Ohanaeze Ndigbo" after reports of little or no sign of sincerity from Ohanaeze to meet with IPOB's preconditions for peace, one of which is to De-Proscribe the group. The group accused them of playing a major role with the South East governors in proscribing IPOB after an operation python dance military invasion of the leader's home in September that also left many dead. The group claimed the Nigerian military is keeping its leader and demands his immediate release, an accusation the Nigerian military has denied. Kanu has ever since then been MIA. Meanwhile, the Nigerian political scene is in severe turmoil. We have seen politicians defecting from one party to another. Last week was a showdown at the National Assembly when men of the DSS - security operatives - barricaded the premises refusing members of the house entrance, which caused a national outrage as Nigerians massively condemned the act. This event saw the DSS chief sacked by the Vice President Yemi Osibanjo. Also, according to sources, a faction of the government wants senate president Bukola Saraki to resign after he allegedly defected from the leading APC party to PDP. Over the last months, there has been a massive defection from APC to PDP thereby upsetting the president who is hell-bent on recontesting in the 2019 presidential election. Meanwhile, Nigerians have expressed dissatisfaction to the current leadership, tagging it "A failed government and a dictatorial one", some are calling for the impeachment of the president amid incapability to rule, besides there have been extrajudicial mass killings and destruction by the Fulani herdsmen "Miyetti Allah" who claims to have protection from the federal government led by President Buhari who is also a Fulani indigene. The president has been widely criticised for total silence on the massacre and destruction committed by the Fulani Herdsmen across the country especially in the middle belt where thousands have allegedly been killed. Therefore, out of dissatisfaction and unfair treatment to other regions of the country, Biafrans have made up their mind to leave the union which they claim was put together by force by the British colonial masters. The first attempt to breakaway was in 1967 which saw millions dead in a bloody three years civil war led by Gen. Chukwuemeka Odimegwu Ojukwu who surrendered after the Nigerian military with the help of the British masters subdued the ill-armed Biafran soldiers who fought for survival and were later reintegrated to the Nigerian economy in 1970 after the war ended. Some of the Biafrans are still upset about the war crimes and events saying if they ever have to fight again it will be a different scene but many hope the situation doesn't lead to another war, therefore, opting for a diplomatic solution, and a referendum seems to be the last option for the people but the Nigerian government is totally against any chance for either a referendum or restructuring and seems hardened to the use of force in an uprising. The international community may be following ongoing events in Nigeria, expecting the UN to wade in to avoid more bloodshed and approve a decisive referendum for the people of Biafra because a referendum for a sovereign state of Biafra is the only lasting option for peace as seen by the people.